The holidays are almost here—and it’s guaranteed to be one of the best times of the year for kids. With activities ranging from having fun outdoors to shopping to school performances, it can get hectic for the whole family, no matter how enjoyable all that togetherness is. Why not free up some precious time this season while ensuring the kids are properly outfitted (and photo-op ready!) by pre-planning outfits that work for a range of holiday occasions, from casual to dressy? 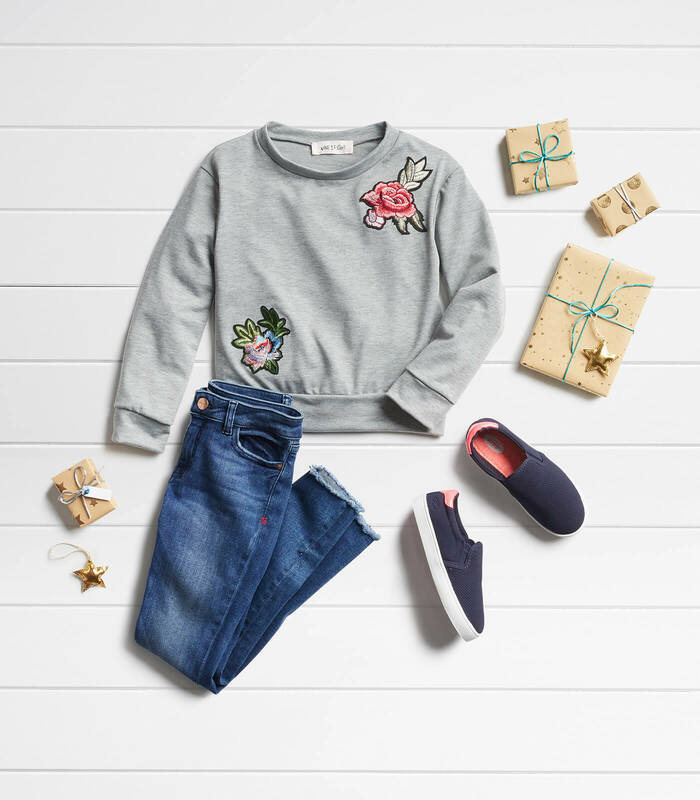 Read on for kid-friendly, parent-approved holiday style suggestions. Whether the family is getting together for a big holiday meal, attending a special theatre performance, or having a portrait taken, it’s a given that at least one dressed-up look is needed for the season. We love looks with a bit of sparkle or fun details to make dressing up an adventure! A skirt with a bit of spangle and a cozy sweater add up to a look that’s dressy enough to please grownups and so much fun that she just might beg to wear it again and again. The finishing touch is a pair of pretty flats—that just happen to look great with jeans, too. 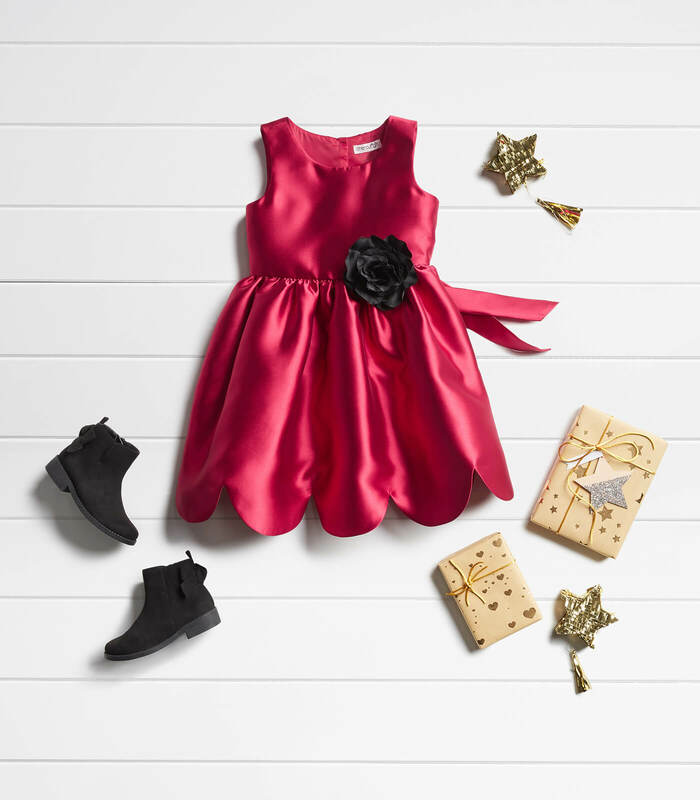 Nothing says “holiday” more than a luxe fabric, and we know she’ll love getting dressed up in a pretty party dress. Why do we love dressy dresses so much? Details like a scalloped hem or extra ruffles add an adorable touch (especially when paired with sparkly tights), and extras like a fabric flower will make her the belle of any ball. Add a cute pair of booties (they’re versatile, too) and she’ll be ready to stay up past her bedtime. 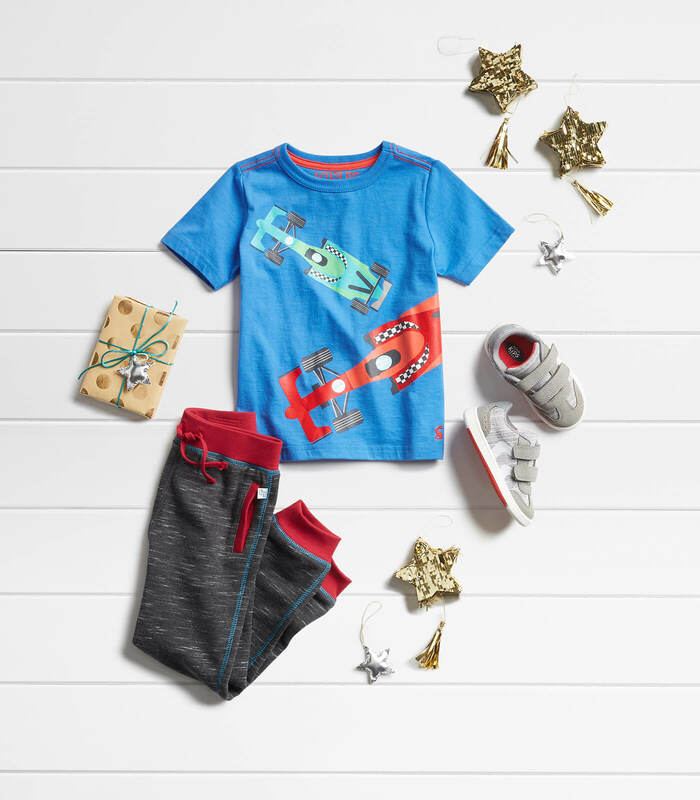 A button-up shirt in a color he loves will come in handy for so many things, and let’s face it, always looks a little more put together that his favorite dinosaur tee or fleece hoody. 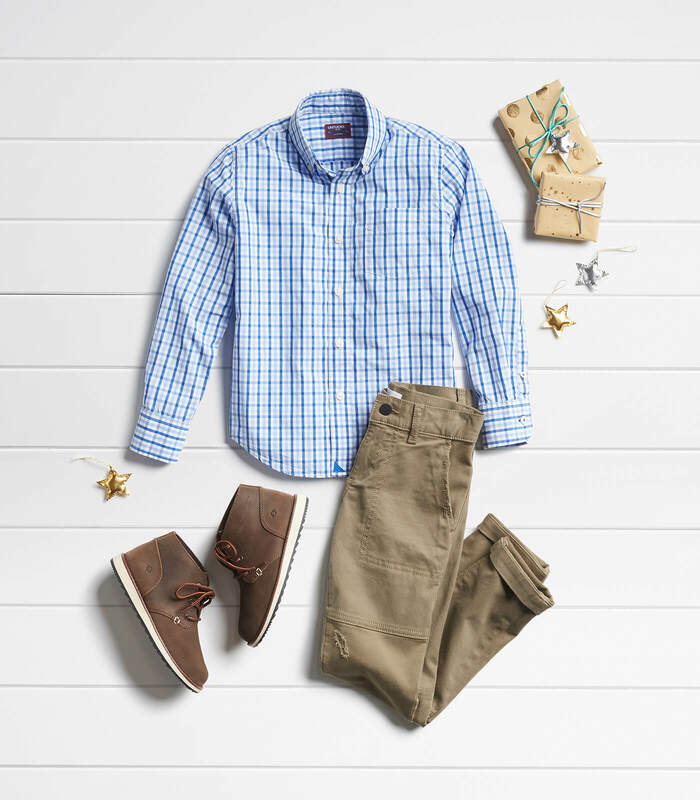 When a family celebration or other dressy occasion rolls around, pair a button-up with a pair of khakis and shoes that feel like sneakers but look a bit more put together. Can’t get him out of his jeans for a dressed up occasion? Make a deal—let him keep his denim and dress it up with a button-up shirt and a dapper pair of shoes. If the shirt is in a soft fabric with a festive print and his shoes aren’t sneakers, he’ll look great and stay in his comfort zone as well. Sounds like a holiday WIN. 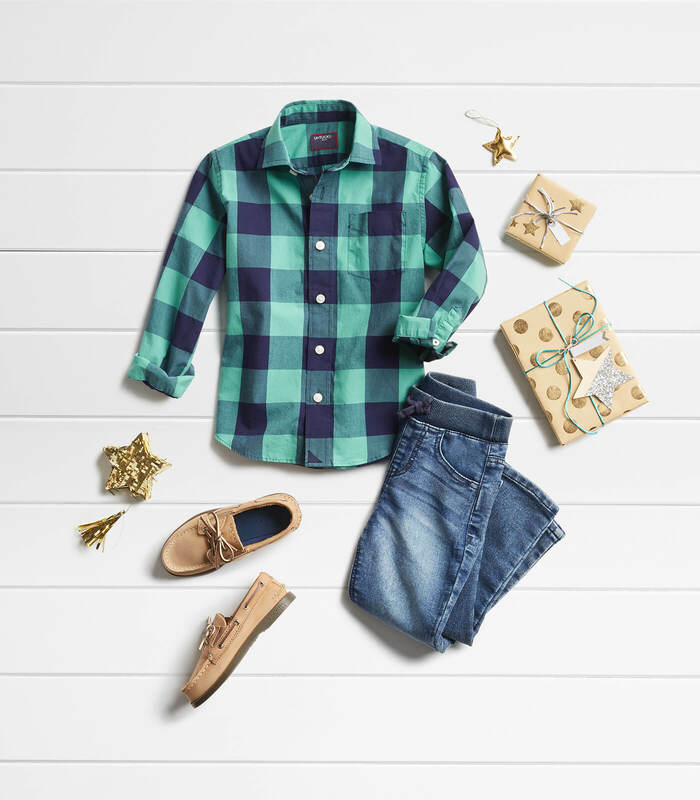 When the holiday activity calendar says ice skating, errands, or just hanging out at home with friends, it’s great to have a few outfits on hand that say “festive” without being too dressed up. Concentrate on pieces that are cozy with fun details that make even the most laid back occasion just a little bit more fun. This season, up their low-key style game by incorporating lots of fun details (Fleece! Faux fur! Glitter!) and super-bright prints and motifs (Florals! Stripes! Unicorns!). All the goodies that make an outfit as great to look at as it is comfy to wear. Add some jeans and fun-to-wear shoes, and she’s all set. 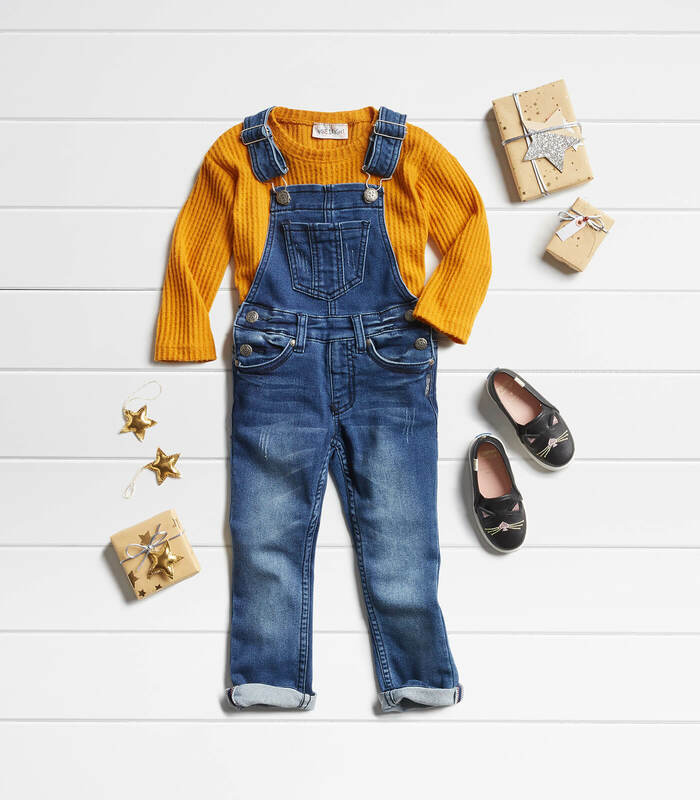 Overalls are a childhood staple, and it’s easy to see why—it’s so simple to pop a pair on and go, and they are perfect for more casual play dates. Spice hers up with a cozy top in her favorite color, and add a touch of whimsy with a pair of kitty cat slip-ons. 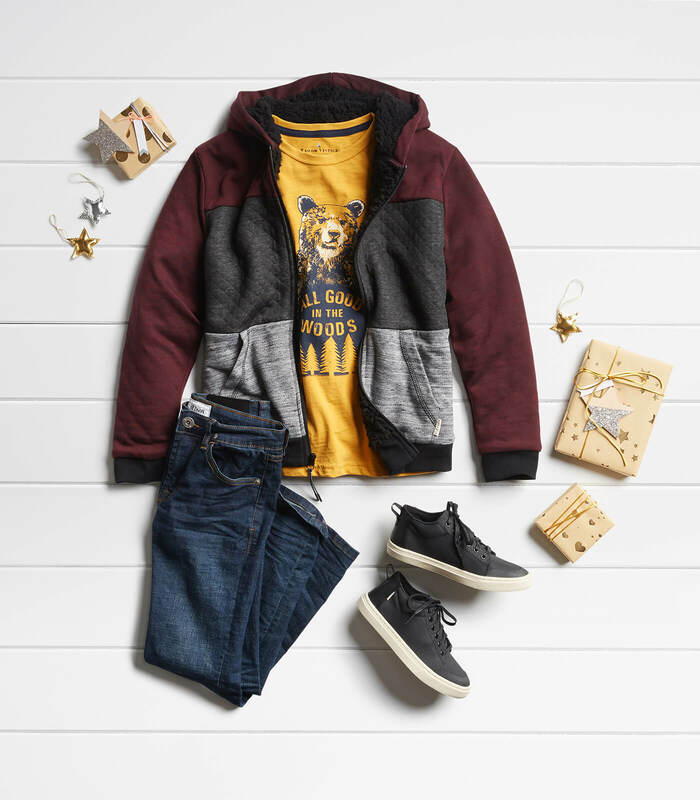 The perfect holiday outing might be one where he can rock his favorites, like jeans and a tee. To make sure he goes out the door looking casual, comfortable and pulled together, refresh his wardrobe with a good looking fleece jacket and sneakers that haven’t seen too much wear and tear. Happy kid, happy parent. When the dress code is “dressed down”, turn to fleece or knit pants with a little something extra. These days, “sweats” can be appropriate for more than just the playground or playing video games. Look for details like a fun cut and pops of color. Pair them with sneakers in a favorite color and a graphic tee, and he’s set for a fun, comfortable day. No matter what your family’s holiday plan is, we have you covered! Schedule your kid’s Fix for an easy peasy holiday.